Call or email us any time. We look forward to hearing from you! Top Trophy was sired by the Great Top Caliber. 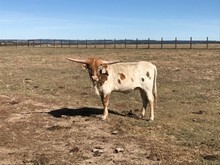 Trophy has a mountain of horn, consistently produces a calf every year, eats out of your hand gentle and a cow you count on. Trophy is bred to M2 Blu Rio Shadow for August 2019 calf. Semantha is a big bodied cow that eats out of your hand. Very gentle and a great cow to establish a herd on. Bred to M2 Blu Rio Shadow for August 2019 calf. A beautiful and very correct 4 year old daughter of M2 Rifleman. Very Gentle and eats out of your hand. Bred to M2 Blu Rio Shadow for a 2019 Calf. An easy keeper with lots of pedigree. Back to back heifers and bred to WS Chief for 2019 Calf. Big framed young cow that eats out of your hand. Pedigree to burn. Bred to M2 Rio Blu Shadow for 2019 calf. A very gentle young cow that grow's them big. Bred to M2 Blue Rio Shadow for 2019 Calf. Bred to M2 Total Eclipse for a 2019 super calf. Check out the young sire we bred her to. Bred to M2 Blu Rio Shadow for 2019 calf.